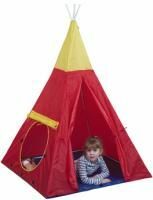 This crimson and yellow teepee is great fun for any little adventurer - it could be a jungle explorer's tent, a secret army bunker, or even a castle tower! The door can be tied back or closed, to make a secure hideout - complete with a window to spy out from - and it'll stay dry whether it's set up in the living room, or out in the yard, due to the waterproof base. 39" wide and 39" deep, it's a giant 51" tall!